· The driving system of the meter consists of two electro-magnets. · The core of these electromagnets is made up of silicon steel laminations. · The load current excites the coil of one of the electromagnets. This coil is called the current coil. · The coil of second electromagnet is connected across the supply and, therefore, carries a current proportional to the supply voltage. This coil is called the pressure coil. · Consequently the two electromagnets are known as series and shunt magnets respectively. · Copper shading bands are provided on the central limb. · The position of these bands is adjustable. · The function of these bands is to bring the flux produced by the shunt magnet exactly in quadrature with the applied voltage. · This consists of an aluminum disc mounted on a light alloy shaft. 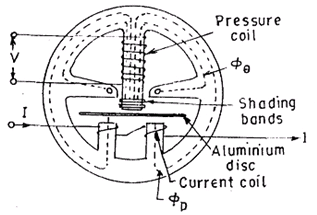 · This disc is positioned in the air gap between series and shunt magnets. · The upper bearing of the rotor (moving system) is a steel pin located in a hole in the bearing cap fixed to the top of the shaft. · The rotor runs on a hardened steel pivot, screwed to the foot of the shaft. · A jewel bearing supports the pivot. · A pinion engages the shaft with the counting or registering mechanism. · A permanent magnet positioned near the edge of the aluminium disc forms the braking system. · The aluminium disc moves in the field of this magnet and thus provides a braking torque. · The position of the permanent magnet is adjustable, and therefore braking torque can be adjusted by shifting the permanent magnet to different radial positions as explained earlier. · The function of a registering or counting mechanism is to record continuously a number, which is proportional to the revolutions made by the moving system. · By a suitable system, a train of reduction gears the pinion on the rotor shaft drives a series of five or six pointers. 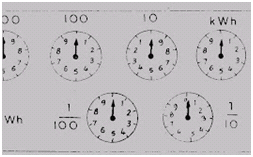 · These rotate on round dials, which are marked with ten equal divisions. 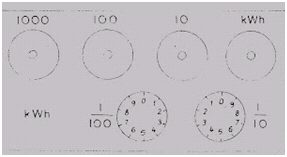 · The pointer type of register is shown in Fig. Cyclo-meter register as shown in Fig can also be used. · Incorrect magnitude of fluxes. · Lack of Symmetry in magnetic circuit.